Don’t try this at home…or on your boat. Unless of course, you want to save $20,000+ in boat yard labor fees. 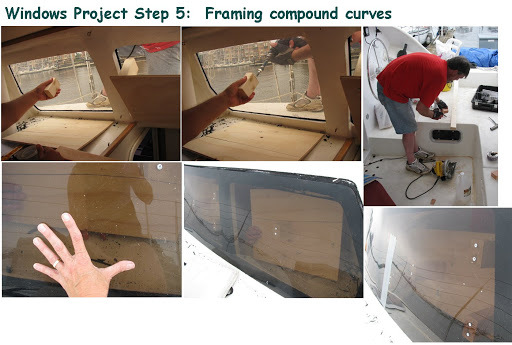 The salon window replacement project began in “concept” – last fall. Without adequate weather or temperatures, windows replacement waited until the following spring. Spring felt more like monsoon season in the tropics. We waited, and continued to revise our plans for constructing window frames. 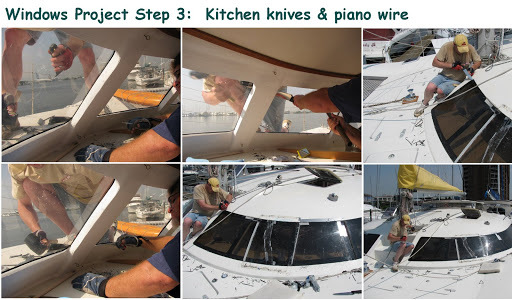 We thought we had lined up a boat yard to assist – but big dollar signs became apparent ($20-$30K) – we realized that we would have to tackle this project ourselves. Weeks away from the official declaration of “summer”, we armed ourselves with “how to” info from the Internet, calls to the sikaflex tech support guy, and a collection of kitchen knives. 36 linear feet of windows, approximately 2 feet high, needed to be gouged out from their attachment to fiberglass – carefully. Acrylic windows needed to removed so that they could eventually be framed and prepped for new acrylic fabrication. A wooden frame would be constructed in key areas around compound curves. Easier said than done. 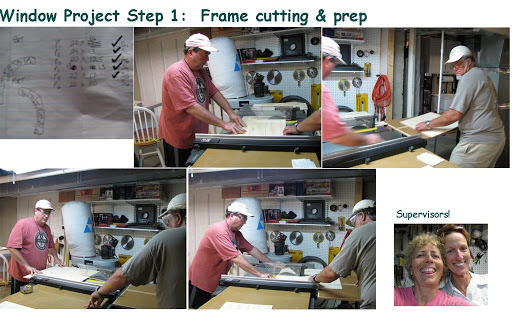 With the help of my bro, Chuck – and his well equipped workshop in the ‘burbs, plywood was cut to size to match 12 window portal dimensions. 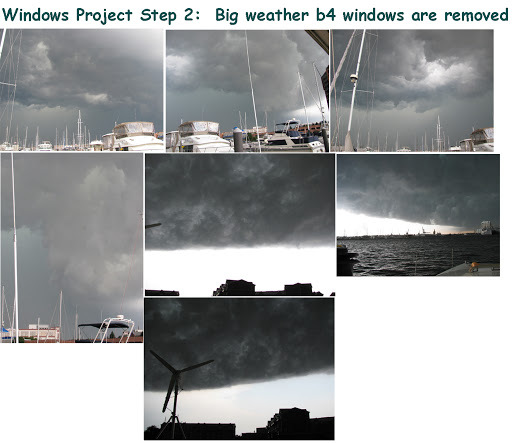 No window project can start, until the daily storm and weather systems pass by. With winds up to 40 knots, and rain appearing as horizontal sheets – we were excited about removing all of the windows that surrounded the salon. May the weather gods cease and desist. Finally, a 3 day reprieve in the weather. Jill’s brother Fred had arrived in town from Michigan looking for work. Lucky for us – as we gladly added Fred’s muscle power to the project. 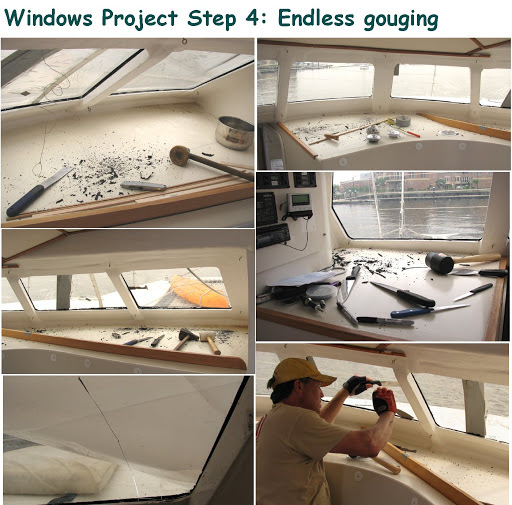 For 3 days, every tool was used to pry the acrylic windows from the goo that held them to the boat fiberglass. Sikaflex. Sikaflex is the goo that appears like rubber, but with adhesion. It doesn’t want to let go of your windows. However, by using steak knives, razors, chef knives, scrapers, carpet cutting tools, piano wire and guitar strings….progress was made. Inch by inch. Temperatures had risen to the 90’s. Sika residue was everywhere. Knuckles were rubbed raw. It was delightful! With the acrylic windows now free from their sikaflex hold, it was time to build wooden frames. This proved to be a challenging. The frames needed to rest on a level plane, and of course the windows formed a huge curve around the salon. 4 separate windows – each covering 3 portals. After hours of head scratching, it was decided to begin with the middle portal of each window – and build each frame point using 2 x 3″posts, a plywood base and two 2×3″ x 8′ lengths… Each post was measured and cut, and then screwed into the acrylic on one side, and into the plywood base on the other. Since you had to measure and cut each post, and remeasure the entire 8′ base for each cut – the frame construction proceeded slowly. On the second day of window framing, an especially HOT and HUMID day – one of the drill bits popped off and made it’s way down the AC duct…directly INTO the Air Conditioner. Not good. All framing work ceased. The AC was turned off. Sweat poured like waterfalls. The little people ran amok. Two hours later, with minimal AC dis-assembly, I was able to reach into the AC unit…and locate the escapee drill bit. The duct work was restored – and AC turned back on. The windows team was hot and tired. Now that both starboard and port side windows have been removed and framed – we proceeded to rent a U-Haul cargo van for transport. 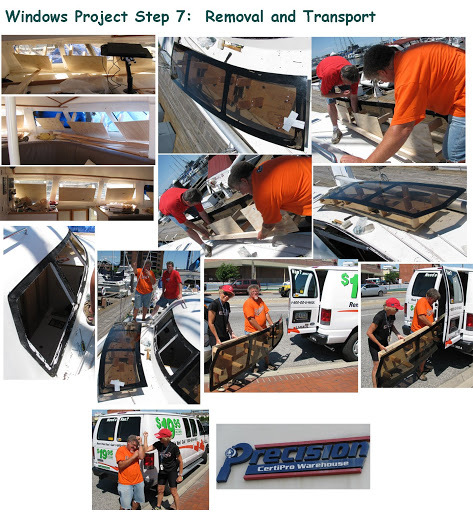 With the help of our dock team and boat neighbors Bob, Becky and Dan – we loaded up the van with the framed windows. As we sat in the salon, enjoying a delightful breeze due to windowless features – we had an epiphany. 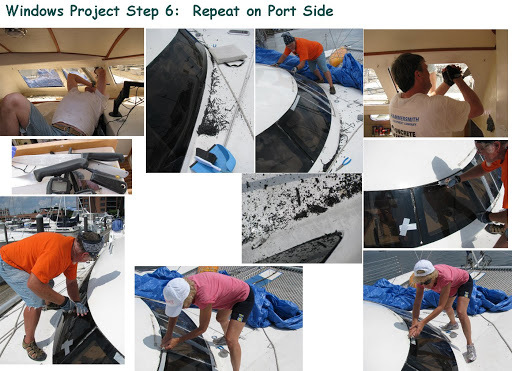 Why not install 4 hatches in 4 of the portals – to improve ventilation? Wouldn’t it be nice to have AIR in the salon? Stay tuned for the windows design change. Hatches to be installed in place of 4 portals. Nearly 7 days from the time that the first “scrapings” occurred, we transported the framed windows to Precision Plastics for fabrication.